Who isn't fascinated with outer space? Its sheer immensity boggles the mind, but thanks to space telescopes like Hubble, we know one thing for certain -- our universe is gorgeous and it should definitely be part of your decor. 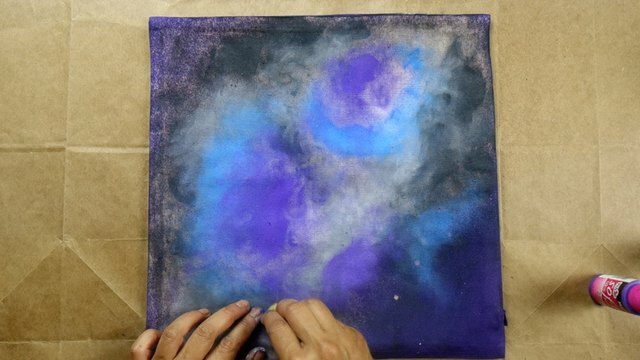 So bring a bit of the infinite majesty of the cosmos into your home by turning some plain old cushion covers into a stellar piece of nebula art. 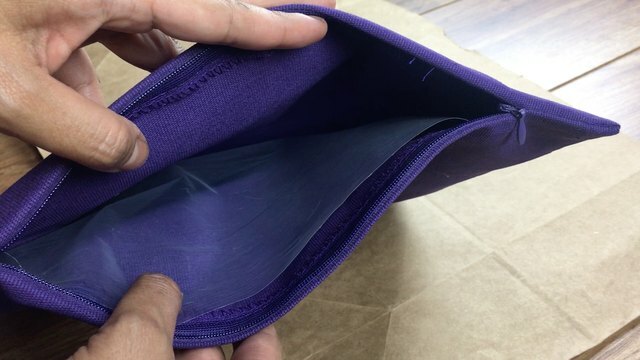 Insert the plastic sheet into the cushion cover. This will protect the other side from any bleach that seeps through. This step should be completed by adults only. 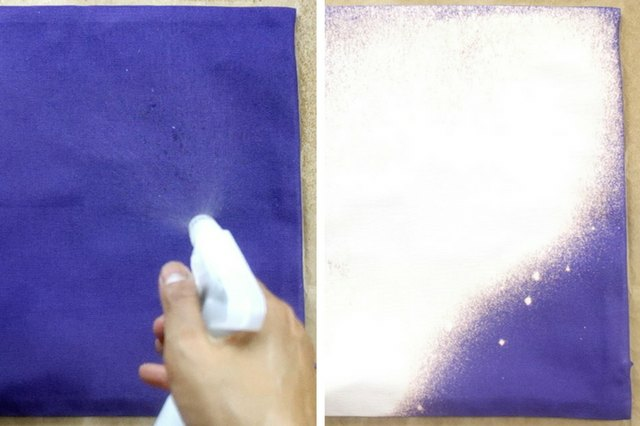 In a well-ventilated area, carefully pour bleach into the spray bottle, then spray onto a couple (or more) random areas of your cushion cover. You want some areas of the original cushion color to show through. Wait 30 minutes for the bleach to take full effect. Whenever using chlorine bleach, make sure to be in a well-ventilated area to avoid breathing in the harmful fumes. As an added measure, you may want to wear safety goggles and gloves. Now it's time to paint! Begin with the color you're going to use the most, then progress to the colors you'll use more sparingly. In this example, I started with black followed by white, purple, blue, then red. 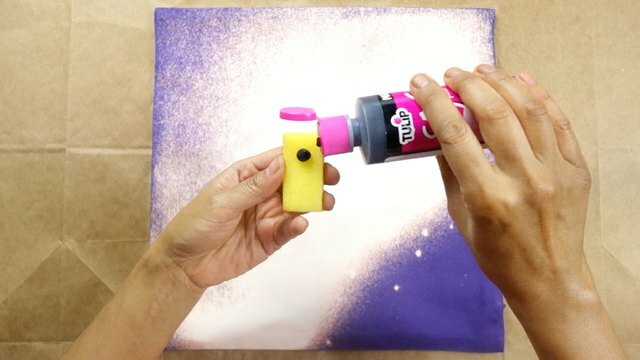 Apply a small dab of paint onto a craft sponge. 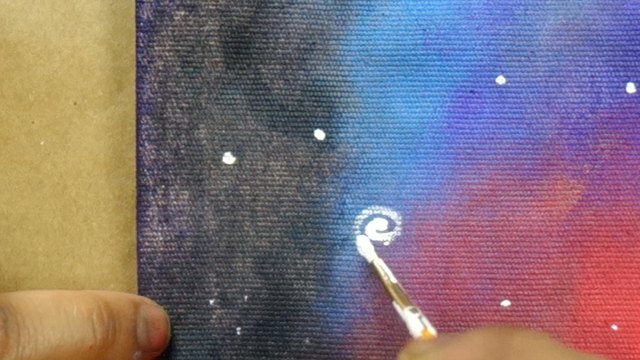 Lightly rub paint along the edges of the bleached spots in a circular and motion. 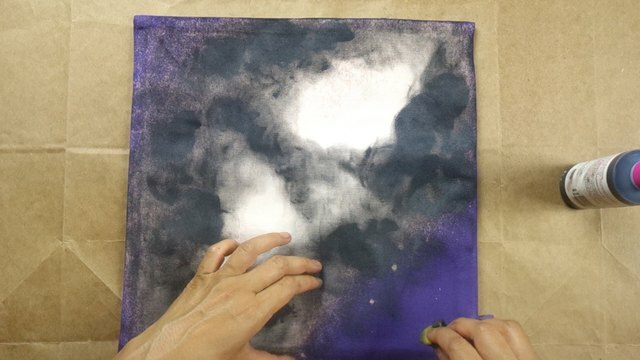 Use light pressure and spread the paint thinly in order to create a smoky effect. 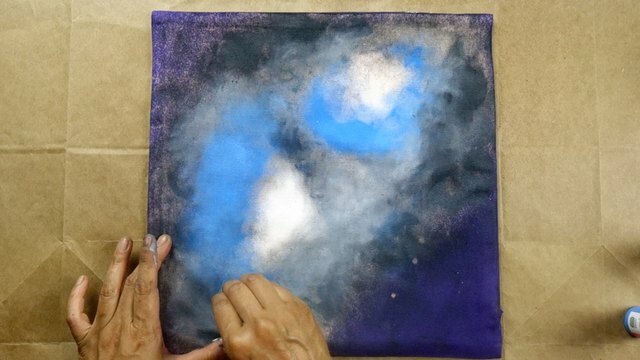 Start creating your clouds space dust! 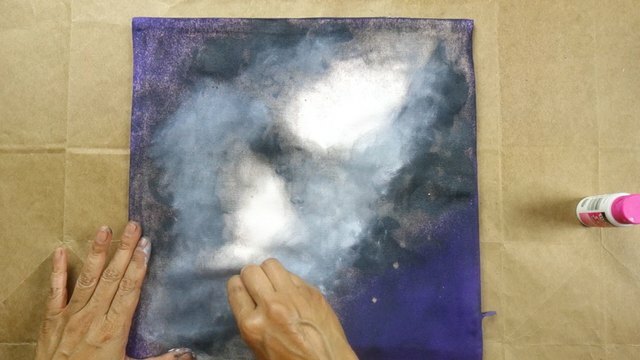 Use white to lighten some of the black areas, using the same circular rubbing method to create grey clouds. Continue painting in the same manner, one color at a time, filling in the large bleached portions from the outer edges in. Note that this is simply one color placement technique -- so be creative. You're the master of this universe! 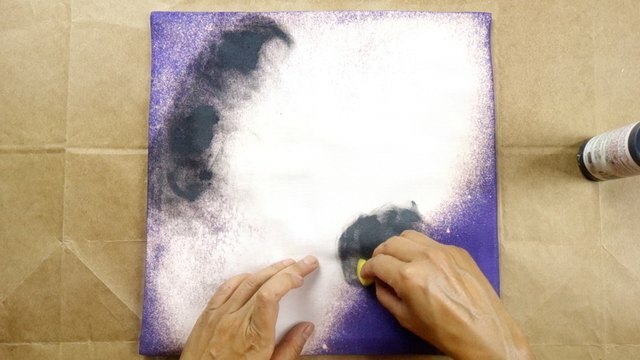 You can create more dimension in your colored areas by sparingly rubbing in a little white. Trust your eye and intuition. For inspiration, do a web search for space photos and visit Hubble's website, especially their awesome nebula gallery. Once you're happy with the way your nebula clouds look, it's time to add stars and distant galaxies. 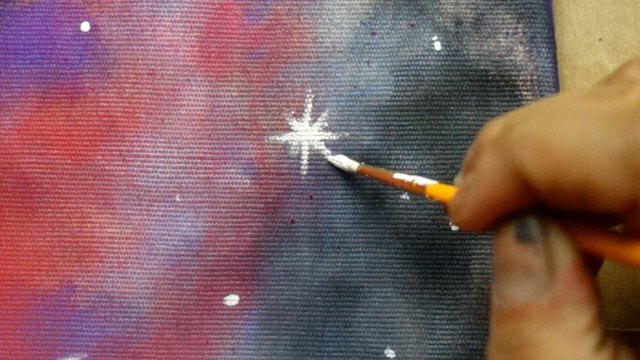 Dip your size 1 or 2 brush into white paint, and apply small dots here and there. You can also create dense star clusters in a few areas. Galaxies come in different shapes, but the funnest ones to paint (in my opinion) are spiral galaxies. Toss in a few! 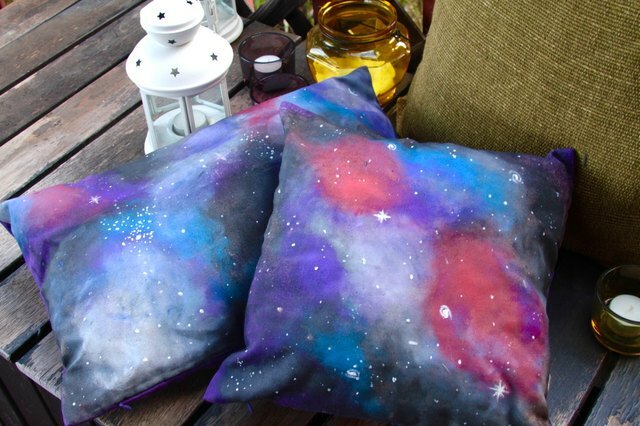 Finally, finish off your space-themed cushion with some big, gleaming heavenly bodies. Now, behold your celestial masterpiece. 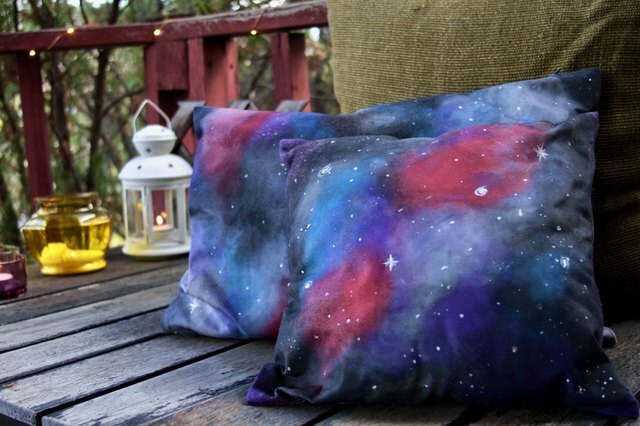 Though the universe wasn't created in a day, these cushions can be whipped up in just a few hours, making them awesome last-minute gifts for the space buffs in your life.